Vendor Information - COOK WELL. EAT WELL. LIVE WELL. 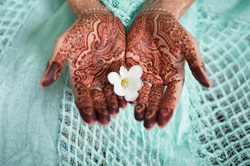 DREAMING IN HENNA, body art in traditional as well as contemporary styles. Sandy also does upcycled objects such as journels, jars, mugs and bottles with henna designs on them. TRACINA'S GOURMET SPECIALITIES, Italian all natural specialities and sauces. NORTHERN FARM MARKET/FARMER BOB, selling produce at the market. BOLLINI BOTANICALS, selling a variety of herbs in pots and bundles as well as eggs. WOOD CREEK FARM Nancy Lopez and Nancy Smith did a spinning and weaving demonstration and talk. potted plants and flowers as well as baskets handwoven from Africa. LADYBUG JAMMIES, offering unique jams, jellies and marmalades. JARHEAD SALSA, selling homemade fresh salsas, queso, sea salt and chili lime tortilla chips, bloody mary mix and salsa in jars. 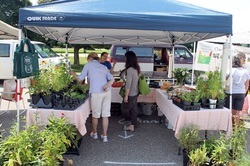 TRI COLOR FLOWER FARM AND PRODUCE, selling produce and flower arrangements for different seasons. SOL KOMBUCHA, Caleb Pepera gave a demonstration and talk about how make your own Kombucha teas at the market in 2016. CRAZY MOMMA'S HOMEMADE, homemade household products for all your cleaning and freshening needs. GALLERY DUTRO FINE JEWELRY, custom made jewelry, pendants, vases and bottles. THYME AND A BOTTLE, vinegars, pickles, switchel drink and insect repellent. BEE BOOTY LLC is our family run beekeeping business of 10 years. We sell unprocessed raw wildflower honey in a variety of volumes and beeswax based natural skin care products. 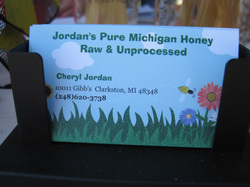 All our honey and beeswax is derived from our hives here in Clarkston, Michigan. JAMIE RUTHENBERG, author of children's educational picture books about the adventures of Miles the rabbit. DIA CUSTOM JEWELRY, custom made jewelry from sterling silver, gold fill, copper and brass, crystals, precious and semi precious stones and pearls. KAWAIDA BUTTERS AND MORE, organic body butters, balms and scrubs. 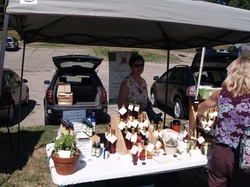 PORTER'S ORCHARDS, we offer at the market from our farm cider slushes, apples and cider, donuts, berries, tomatoes, peaches, plums, pears, apricots, nectarines jams, honey, popcorn. We also sell Uncle Peter's Pasties. NATURE'S URBAN FARM Creating an Edible Landscape that uses Organic and Permaculture princlples; working with nature, attracting wildlife, promoting ecological diversity. 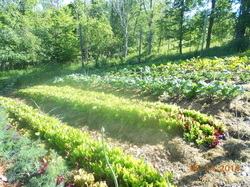 Fresh greens, herbs and vegetables are harvested weekly. WANDERING FOOD PHARMACY, creating the original Whoats energy bars using all natural ingredients in either regular and gluten free. J DEAN SAUSAGES AND JERKIES, we offer brats, jerkies, bacons and snacks. Our store is located at the corner of Union Lake Road and Cooley Lake Road in Union Lake. XIONG'S MINI MARKET, selling produce and floral arrangements. ANDY OMENS, demonstrated caning techniques and talk at the 2016 market.. ESSENCE ON MAIN, selling at the market breads, muffins, scones, cookies and coffees. The store is located on Main Street in Clarkston. 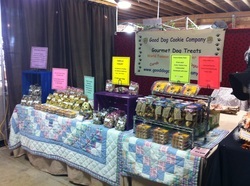 CINDY AND MARK WILLIAMS, offering designer breeds and rolls as well as custom made soaps and clothes. CLARKSTON COMMUNITY GARDEN The purpose of the Clarkston Community Garden is to create a sustainable organic garden and nursery for meeting the community needs while engaging community participation in an outdoor, lifelong activity. The Clarkston Community Garden is located at the Northeast corner of Stickney and Pine Know Roads in Clarkston, Michigan. It is run by Parks and Recreation and Seniors Department. Members of the community can get their own 10x10 plot to grow vegetables and plants of their own..
REAL MEALS FOOD COMPANY, Kathy Shelton gave monthly demonstrations and talks at the 2016 market.. INDEPENDENCE TOWNSHIP LIBRARY, sharing information about the local library as well as sharing games with everyone. RED BIRD FARM, selling organic produce using organic practices as well as flowers, plants and herbs. PDC LLAMAS PRODUCE, produce is locally grown using organic principles and practices and organic seeds if and when available. Known for fingerling potatoes, large variety of onions, garlic from own seed, leeks, shallots, greens, Heirloom Tomatoes and llama yarn from my own llamas. MARKET CISNEROS, offering items made from leather, handmade home decor, jewelry and hair accessories. INFINITE BLISS, 100% natural essential oils, bug repellents, butters and more. 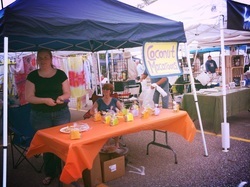 VIVIENNE'S AND BONZ IN A BASKET, is a Clarkston owned and operated home based business. Custom baskets can be created for your pet as well as embroidered towels and pet blankets. Homemade pet treats are baked in small batches from the freshest ingredients. When you buy from Bonz in a Basket you can be confident treats are freshly made. Only the best for your pet. New this year VIVIENNE'S custom made cakes and cupcakes. EAST RIVER ORGANIC FARM is a small organic farm in Oxford, Michigan featuring organic vegetables, grass-fed beef, lamb, eggs, pork, chicken and turkey. 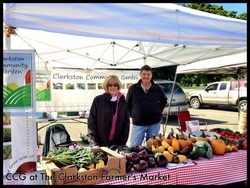 We have been a full-time vendor and supporter of the Clarkston Area Farmers Market since 2008. 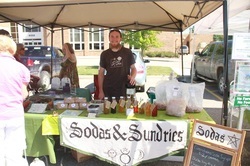 Soda & Sundries is a local business specializing in all-natural, artisanal soda syrups, teas, and more, with a commitment to sustainable business practices. 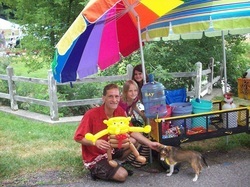 For the past seven years, he has been a vendor at the Clarkston Area Farmers' Market, selling a variety unique and exciting of products including DIY gourmet mushroom kits, seedballs, and more. This year, Soda & Sundries will be showcasing a dazzling array of goodies, including delicious seasonal & limited-release soda syrups, delightful herbal teas, beautiful handmade artwork, and much more, so come stop in and see what's happening-- We're one of the locals. A small farm nestled in the rolling hills of Metamora. Nature's Harvest is a Certified Organic Farm and verified environmentally friendly through MAEAP (Michigan Agriculture Environmental Assurance Program), which uses only plant based compost, no manure. We believe in keeping in harmony with nature, using companion planting, French Intensive Farming and Permiculture methods. We treat the land like its a living breathing extension of our home. we grow gourmet and heirloom seasonal crops and herbs that will come into harvest during the spring, summer and fall. Coconut Macaroons and pound cake. Raw honey and free range eggs. Clarkston Community GardenThe purpose of the Clarkston Community Garden is to create a sustainable organic garden and nursery for meeting the community needs, while engaging community participation in an outdoor, life long activity. The Clarkston Community Garden is located at the Northeast corner of Stickney and Pine Knob Roads in Clarkston, Michigan. The Upland Hills CSA Management Team worked hard to gain our organic certification and the CSA was certified Organic in previous years by the Ohio Ecological Food and Farm Association (OEFFA). Starting March 2013, however, we did not renew the certification due to cost considerations. We remain committed to ecologically responsible and sustainable farming practices. 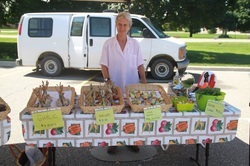 The Upland Hills CSA is located four miles east and two miles south of Oxford. 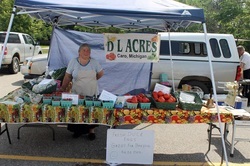 Organically raised produce including vegetables, flowers & herb plants from Lapeer, Michigan. We are a third generation family-owned apple orchard in Goodrich, Michigan. Premium, all-natural gourmet brownies. Hand-crafted in various delicious flavors. 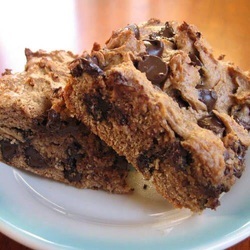 Bulldog Brownies make the perfect gift! Www.LadybugJammies.storenvy.com makes unique and delicious jams, jellies and marmalades using organic and non-GMO produce. Our amazing jams are handmade in small batches- right here in Clarkston! We cheerfully give samples at every Clarkston Area Farmers Market. 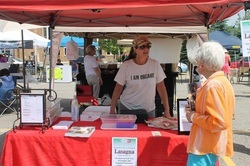 This is our 2nd year at the market and look forward to meeting our fans.